The history of the Nebraska School of (NSA) Agriculture begins in the early 1900s when it was created as an agriculture high school. At that time in history, most students ended their formal education in eighth grade. If a student wished to continue his or her education, he or she would have to attend a state high school and, in most cases, that meant leaving home to live on a high school campus. In 1911, the Nebraska State Legislature voted to build an agriculture high school somewhere in southwest Nebraska. Curtis won the bid for the school and construction began. 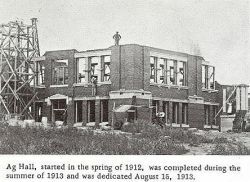 The school's Agriculture Hall was completed in 1913 and welcomed its first students in the fall of that year. Since the school was a state institution, no tuition was charged. Room and board cost $4 a week and the students stayed in the "best homes in Curtis". Eventually dormitories were built to house the students. Courses offered in 1913 were described as follows: "A strong and practical course in agriculture and manual training and regular high school subjects offered for the young men who wish to go back to the land. A course will be offered for young women in sewing, cooking and the art of housekeeping, along with the regular high school subjects." 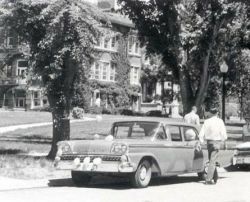 While most of the "Dorm" Students were from the most rural parts of Nebraska, some came from the larger cities. Some students came from far away states and of course there were local students. Everyone started out on an even keel as few knew more than a handful of the students in their class on the first day. About 1946 the name was changed to University of Nebraska School of Agriculture (UNSA) and the school continued as a high school. In the early 1960s, a Nebraska Unicameral legislature interim study revealed there was a serious shortage of adequately trained, technically educated, work force to meet the needs of farmers, ranchers and agribusiness related industries in Nebraska. The decision was made to phase out the high school. UNSA shared space with the University of Nebraska School of Technical Agriculture (UNSTA) for three years until the last class of high school students graduated in 1968. The name was later changed to Nebraska College of Technical Agriculture and has greatly expanded it's campus by 2013. Fearing that the history of NSA-UNSA was being forgotten, Ken Mercer (Class of 1964) began the monumental task of scanning pages of all the yearbooks he could get his hands on. Those pictures are now posted on this website for your enjoyment. If you have not already done so, we invite you to browse though the yearbooks or do a name search. You may be surprised how many friends and relatives were "Curtis Aggies" during their high school years. Some of the yearbook pages contain bits of history of the school as well as the area. We have sorted out a few of those pages and they can be seen by clicking the link named, what else, Yearbook Pages Containing History located in the links on the left side of most pages. A story of the politics and complete history of the school can be viewed in an article titled 'Establishment of the Nebraska School of Agriculture at Curtis, 1911-1913' in the Fall 1980, Vol. #61, No.3 issue of "Nebraska History, A Quarterly Magazine". Note: The link should open in a new tab and is an interesting read though it is a rather large PDF file.